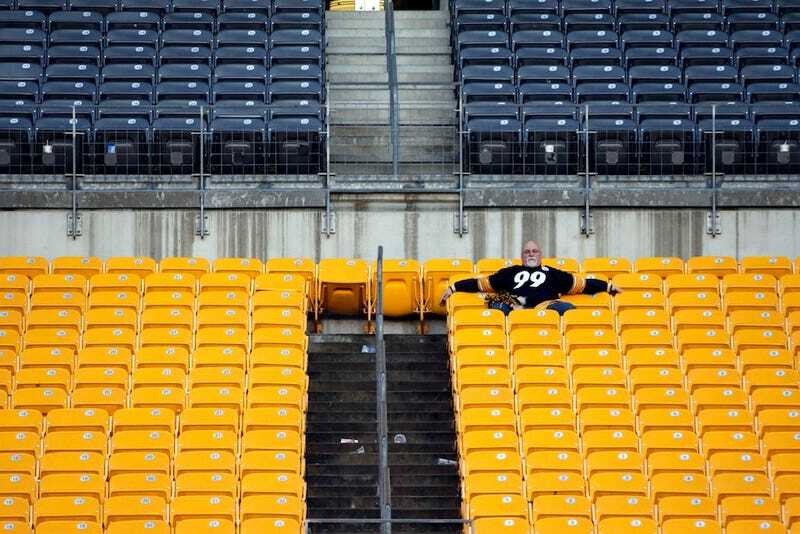 The Steelers went 8-8 in 2012, missing the playoffs for just the seventh time in 21 seasons. Surely there must be some sort of explanation. So why not a really dumb debate over whether the team lacks veteran leadership? To review: On Feb. 17, an anonymous player had this to say to the Pittsburgh Post-Gazette about LaMarr Woodley, an outside linebacker whose injuries have made him far less productive the last two seasons. "He was awful," the player said. "He tells us he works out, but we didn't see it. He wasn't in shape. That has to be a reason why he was always hurt." The comment set off a chain reaction from several other Steelers. The common refrain was that the players didn't take too kindly to the snitching, especially because the snitch didn't put his name behind his words. Ryan Clark said it was indicative of a "fracture" in the locker room. Antonio Brown cited it as proof that the Steelers "[weren't] a team in 2012." But if family squabbles are supposed to stay in-house, how is the situation made any better when members of the family keep lining up to say family squabbles are supposed to stay in-house? Ben Roethlisberger finally weighed in today, rightly telling the Post-Gazette's Ed Bouchette that all this internecine squawking is indicative of nothing more than "the frustration" of a disappointing season. That didn't stop Florio from sniping that "the conflict is still there." But is it? The Steelers—like lots of other teams—were a handful of plays from making the playoffs again. It happens: In today's NFL, most everyone hovers around .500, with a good break here or there determining whether the season gets remembered or forgotten. But players, for whatever reason, don't believe in luck's great role. So each January or February another disappointing team adopts the language of First Take. Why bother?